Is my hermit crab molting or dead? It is often extremely difficult to distinguish whether a hermit crab is indeed molting, or has passed over the Rainbow Bridge. This is due to how similar in appearance the two can be. 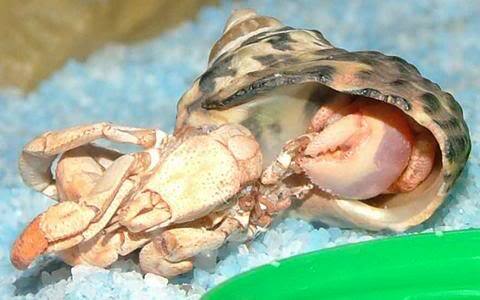 The approach a hermit crab owner takes can mean the difference between life or death if the crab is molting. I have witnessed numerous land hermit crabs during the molting process and identified four main molting positions. The most common position begins with the hermit crab lying down on their side while shedding their old exoskeleton. The eyestalks are in a laid down position, antenna appear to be tucked under their eyestalks between the large cheliped and feeding claw in a downward position. The legs appear to be lifeless and very limp with a slight curl. When they lie on their side and are ready to shed their exoskeleton, they come most of the way out of their shells, only keeping the very tip of their tail within the shell. At this time, the hermit crab appears to be lifeless. If one watches long enough and very closely, they will see the hermit crab do an occasional very slight jerk of a body part and a very slight wiggle as they begin to loosen their old exo from the new exo. In between these slight jerks and wiggles, the hermit crab lies extremely still and appears dead, with a very slight occasional movement about their gill area as they take a breath to be able to continue with the deed they must complete. Once the old exo is loosened from the new, the little jerks and wiggles they do are slightly more noticeable. 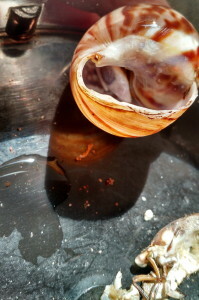 A brownish/brownish orangey fluid appears as the old exo splits, and the hermit crab begins the removal of it. If the hermit crab’s old exo is darker in coloring, it resembles a bubble like appearance going through the old exo as the hermit crab removes each part of his new body from it. Another popular molting position I have observed is that of the hunched hermit crab. Instead of lying down, they are upright in their shell. All of the above observations apply, only the position is different. The molter comes out of their shell to where their first sets of little legs are. As they begin their molting process, they are in the hunched back position. Again, they are very still and appear dead during the molting process while in this position. 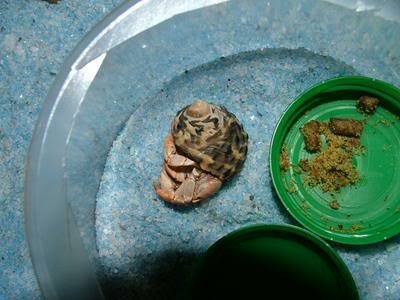 On a few occasions, I have witnessed hermit crabs molting while in a sitting up position. By this, I mean the opening of the shell is facing straight in an outward position. The hermit crabs legs, pinchers, and head appear to dangle out of the shell. The eyestalks, antennas, and limp legs, etc. are all observed in the same manner as mentioned in the first paragraph while the hermit crab molts in this position also. On one occasion, I had the pleasure of witnessing a hermit crab molting upside down. The only thing I could see were her limp legs partially out of the shell as she molted, and the bubble-like appearance as she loosened and removed her old exoskeleton from her legs and pinchers. The appearance of a hermit crab in the process of molting can be similar to that of one that may have passed over the Rainbow Bridge. If unfortunately the hermit crab has passed on, there is not much a crabber can do for him except to bury him. If the hermit crab is indeed molting, disturbing the hermit crab at such a fragile and critical time of their life could mean death to that molter. If one does find a hermit crab in any of the positions I mentioned above, (or any other position), and you are curious as to whether the hermit crab has died or is molting it is always best to play it safe and act as though the hermit crab is molting. If he is in isolation, do not disturb him in any way. If he is found in the main Crabitat where there are other tank mates within it, push a cut two liter soda bottle around the hermit crab to the bottom of the tank, and remove all climbable objects away from it so the others cannot disturb him. Leave him be. One must have patience when this questionable situation arises. This is a very critical time in your hermit crabs life that only you can make the difference as to their life or death by the action you take when you first notice them. Previous Post: FAQ What is molting? Next Post: FAQ Is Polyvinyl Chloride/PVC Pipe safe to use in the crabitat?